Some very exciting news from Lizzy B Loves, today. It's finally here!! Lizzy B Loves is unveiling its new look. It's been more than a few years in the making, but the new website (and blog) are finally ready to be showcased. All of your favorite visual + sparkles and color palettes are there, along with a more prominent exhibition of the Lizzy B Loves Invitation Collection. With a new logo and icon, Lizzy B Loves will be sure to differentiate itself from the grand array of Wedding Invitation & Social Stationery Designers out there. Be sure to read more about the new look of Lizzy B Loves and the many developments to be announced in the future. That being said, this blog will remain as is, in this same spot, as a reminder of the beginnings and explorations we took via this vehicle. Make sure to visit the new blog and update your rss feeds to keep track of the many new adventures. More great news in a bit...at our new house. Starting this mid-week day with a beachy visual + sparkle = inspiration which reminds us of what's to come this summer with its vibrant colors. 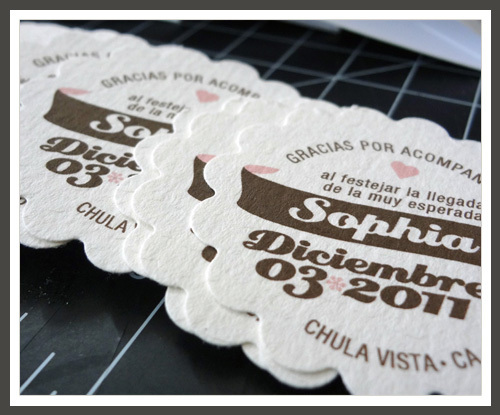 I've been working on a couple Wedding Invitation Suites based on this Mexican tile-inspired Invitation from last summer, remember? 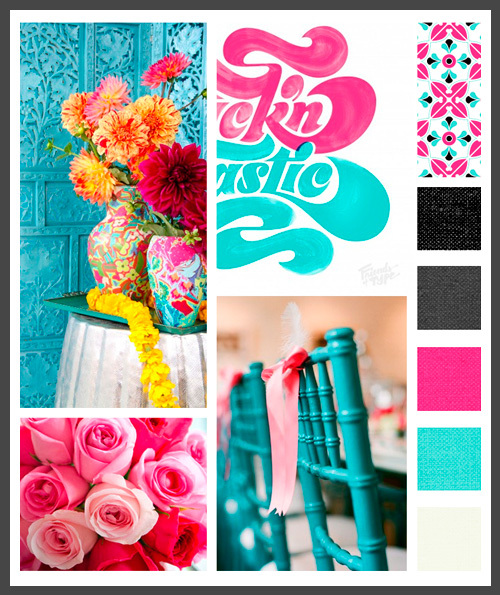 The Bride-to-Be's chosen color palette includes two very Mexican colors, fuchsia and turquoise, which are the perfect compliment to the wedding destination of Tulum, Mexico. 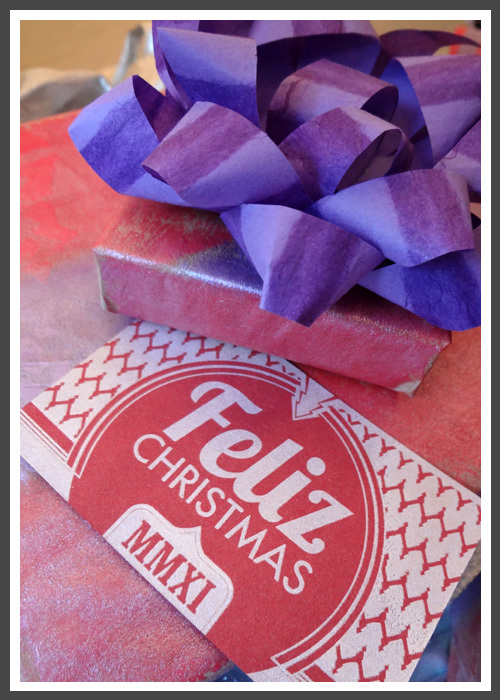 I just wanted to give you a little sneak peek...make sure to click here to view the visual inspiration in full, and keep an eye out for my Mexican-inspired tile pattern with a completely new color scheme! The New Year came just as if it were any other day. It's not until now that I'm starting to feel that 'New Year' energy and am getting organized to finalize some LizzyB Loves projects which have been pending for a while. Some great news came with the end of last year which I'll be able to share with you in a few months (hint, hint: it involves a magazine!! ), but for now I'll fill you in on the soon to be accomplished goals. You've obviously noticed my dwindling down of posts over the past few months on this here blog, well, it's due to quite a list of things which I just don't need to bore you with, but most importantly because I've been working on updating the blog with a new design, new invitation/portfolio section, invitation pricing, easier ways of ordering your invitations, oh, and a new home for the blog as well!! So, I'll keep you posted on the progress, which should be temporarily available in the next month. 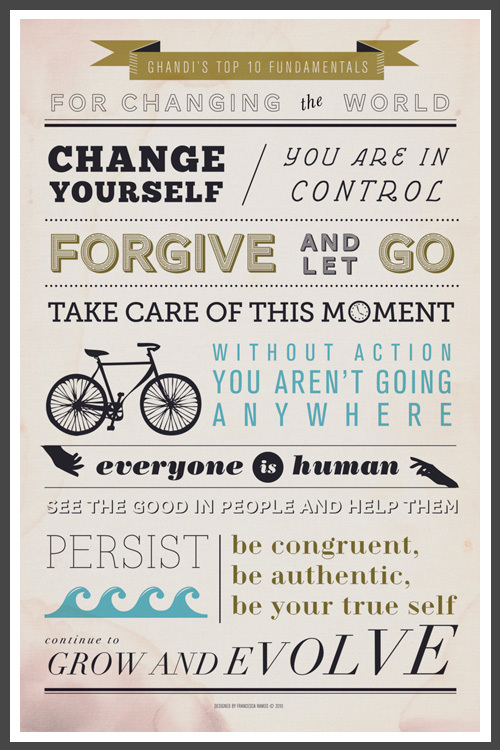 For now, get inspired, as I did, with these graphic finds via my Pinterest 'Great Words' board. 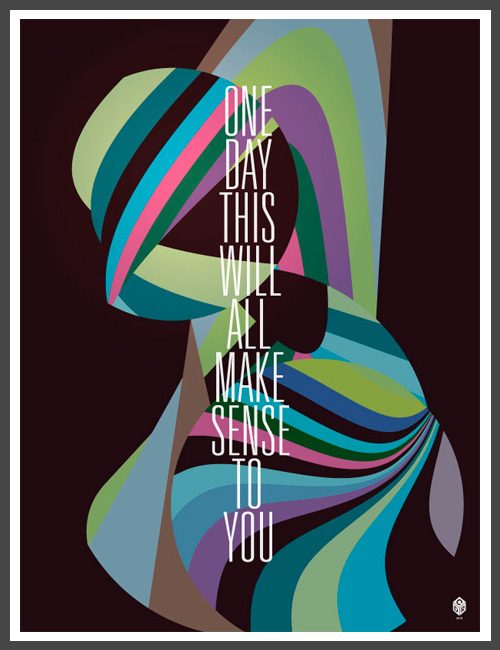 Sometimes a little visual spark is all that's needed to give form to such true words. This year has been one of many life changes. My love (and may I add, now Fiance) and I are finally back in our own place after many years of living with relatives, many LizzyB Loves projects with some fabulous brides and grooms to be have come my way (and many more to come next year), and other less than happy moments which after they pass, you figure were essential life lessons. These events have made me realize what is truly important in life, as well as made me see that out of every situation a better day will come. 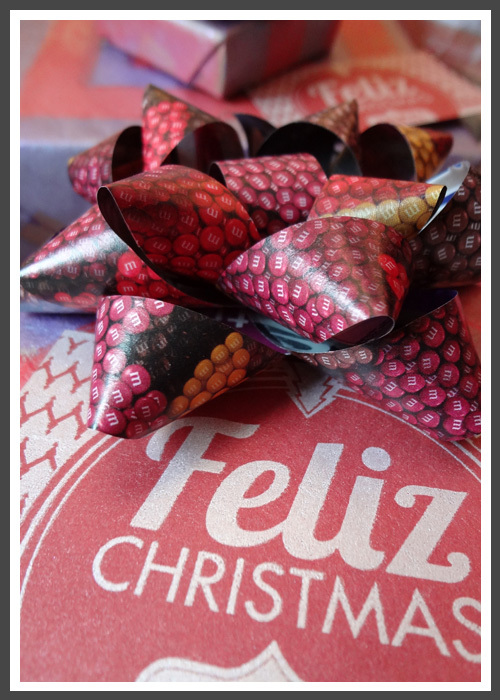 And, what does all this sentimentality have to do with diy Christmas projects you may ask!! 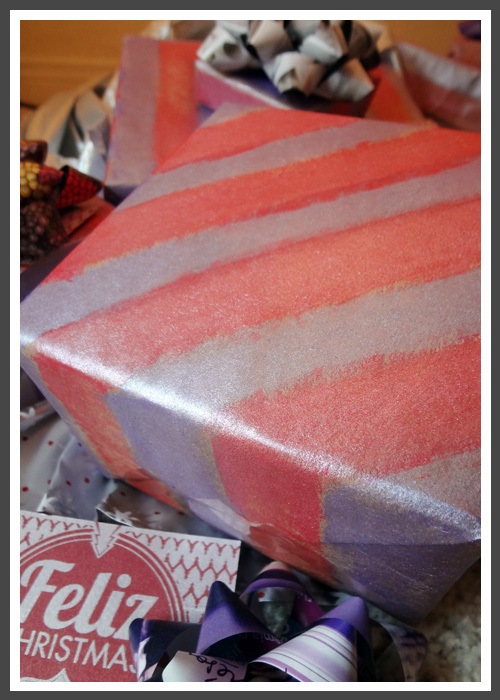 Well, out of need comes resourcefulness, right, so as a creative Holiday project this year we decided to make our own gift wrap. 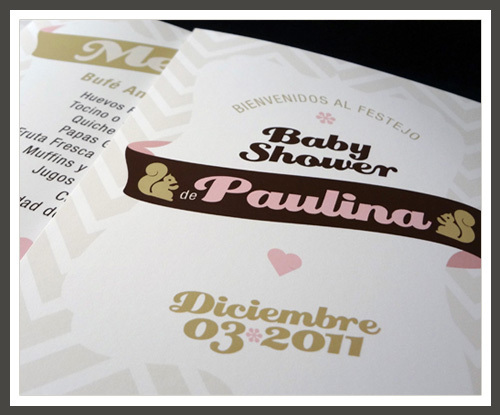 Our initial idea was to stamp a design Gabriel, my Fiance (I don't think one can ever tire of saying that! 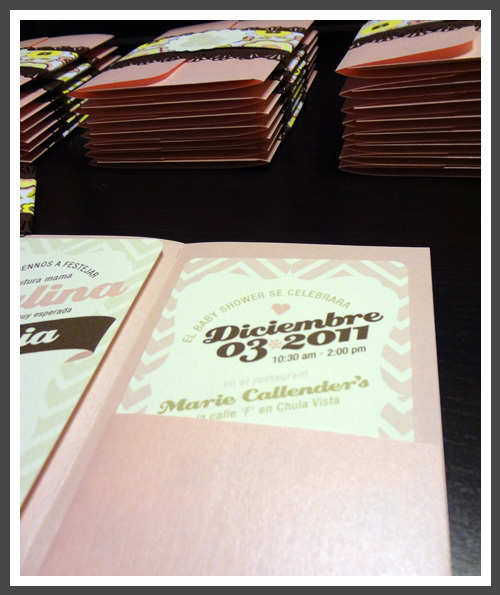 ), created and which I would cut on linoleum onto the craft paper. After thinking about that for a second, we decided to go a simpler way and stencil the design instead. Ummm, better said than done. That turned out to be a bit too much for us as well so out of frustration I started painting over the only design I managed to stencil on the box and I got these very graphic patterns. 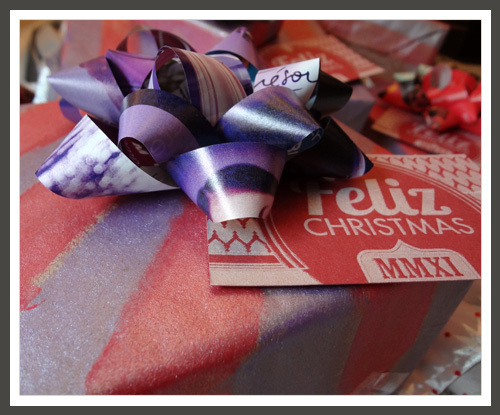 Combining the two red and purple metallic paints we were going to use for the stenciling, we came up with this accidental outcome for this year's Christmas gift wrapping. 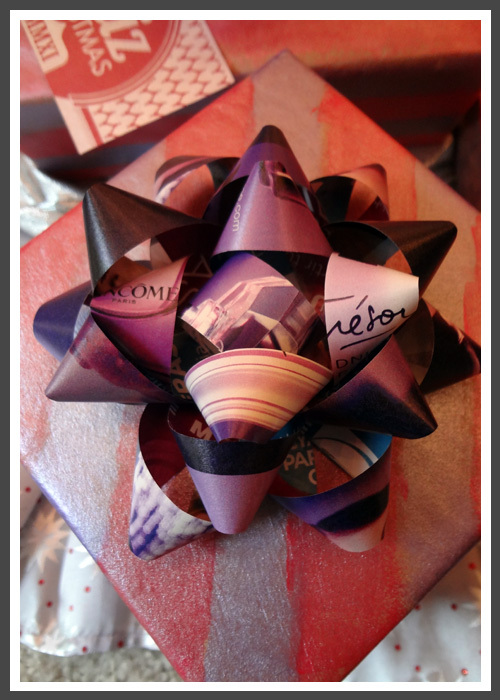 Keeping with the diy approach and using whatever you have available, I followed this fun and easy tutorial via 100 layer cake for these retro gift bows made out of magazine pages. Again, total suprise outcome. I was thinking of buying colorful magazines to make the bows and after a gander through one I just happened to have laying around my house (which is odd, I rarely buy magazines; this one was probably a very old one which was given to me.) I found the perfect color ads to match my red and purple color palette. This one above was made from a Lancome ad with Emma Watson; the perfect purple tones and shades. 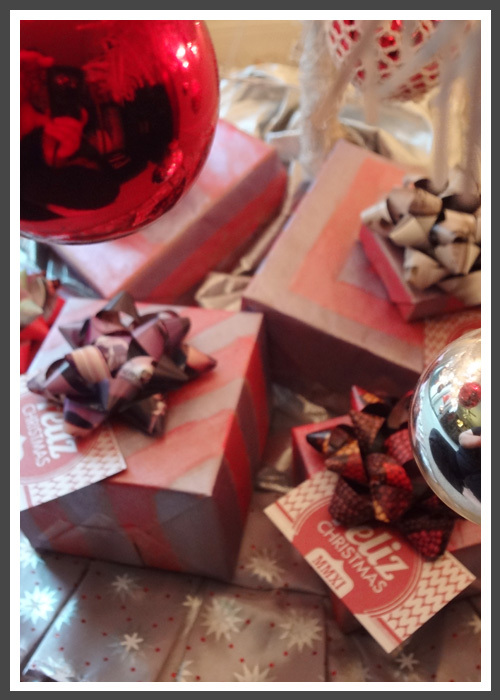 I found an ad for every gift to create a colorful palette of bows. This one above was white, but I loved the contrast it created between the whites of one side of the page with the dark grays of the other side. I couldn't decide which side to use. 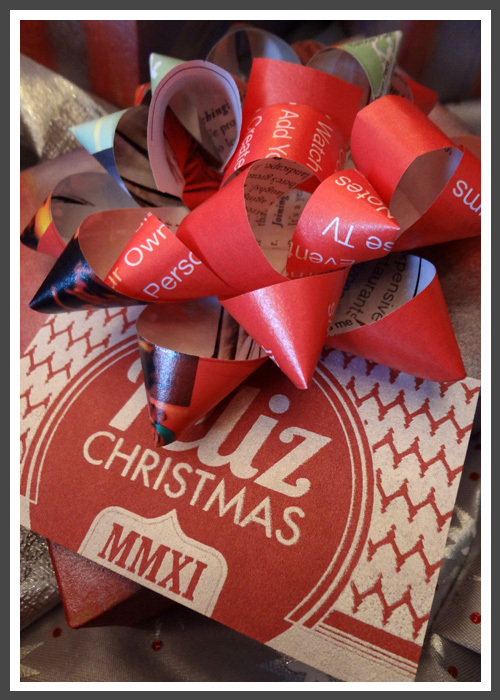 Any paper is perfect for these hand-made bows. 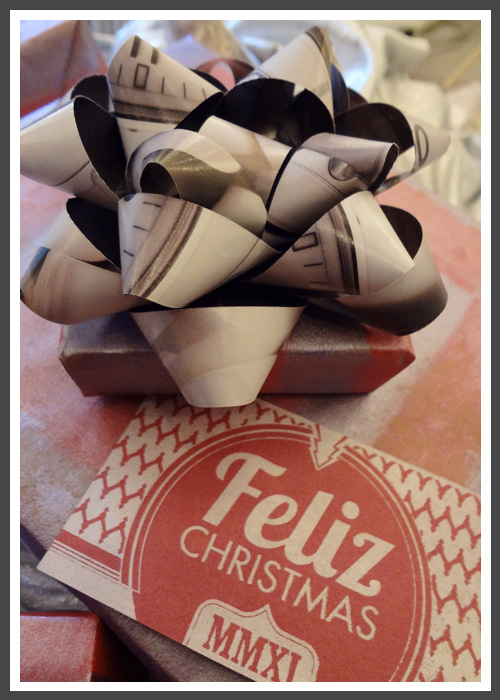 Here's one made with hand-made paper...a scrap I've had for years in my many boxes filled with scraps of everything! Oh, and to add to the do-it-yourself projects, Gabriel and his companions at 8 a.m. each designed and screen-printed Holiday Greeting cards. 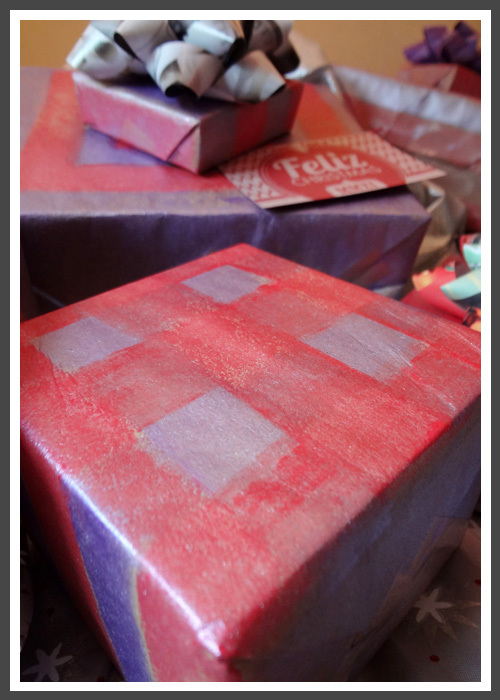 He provided our little Holiday project these remnants of their hard work which served perfectly as gift tags (and, the perfect match, again, to our color palette...in metallic, too.)! Now here is my favorite bow, a full page of red and purple-toned M&M's! Enough said. As a final note on the diy decor, albeit, our ornaments weren't ALL diy, they're ornaments we've collected throughout the years of living together. Some purple, some red, some silver...ummm, that's where the color palette stems from. We decided that instead of buying Gabriel's idea of the perfect Christmas Tree ornaments (Star Wars-themed figurines) we would just stick everything we had on the tree. It turned out to be the best one we've had. 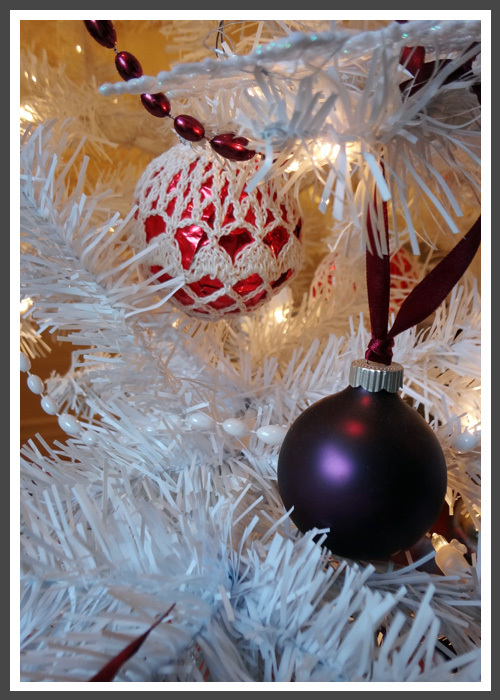 The pretty crocheted white and red ornament you see in the first image in the beginning of the post is a very retro one from a set my mom made when I was very young (oh, they're at least 20 to 25 years old). All keeping with the diy/use-what-you-have theme. So yes, a very serendipitous Holiday this is turning out to be, but a very well DESIGNed one at that!! May you and your loved ones have a happy and safe Christmas weekend. Always remember, it's with the surprise outcomes that we can find joy in the smallest details. 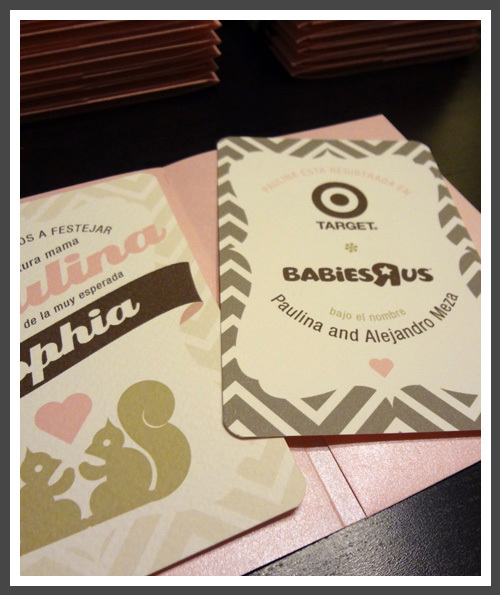 Last Monday I shared with you the squirrel Baby Shower Invitations I designed for my sister-in-law. Well, now I have for you a few of the decorative elements I created for the centerpieces, wall decor, games, favors and corsages. As you can tell, the theme of the whole event was Squirrels. 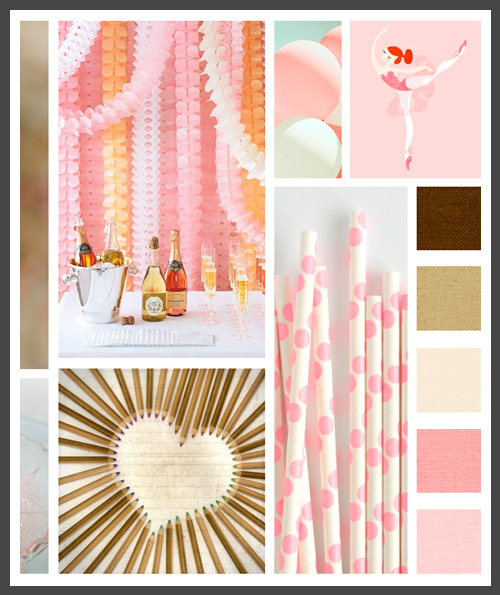 She'll be using the soft, rosy pinks and browns for the future nursery, so I went with the same color palette for the Baby Shower, but added a dazzling of gold here and there. 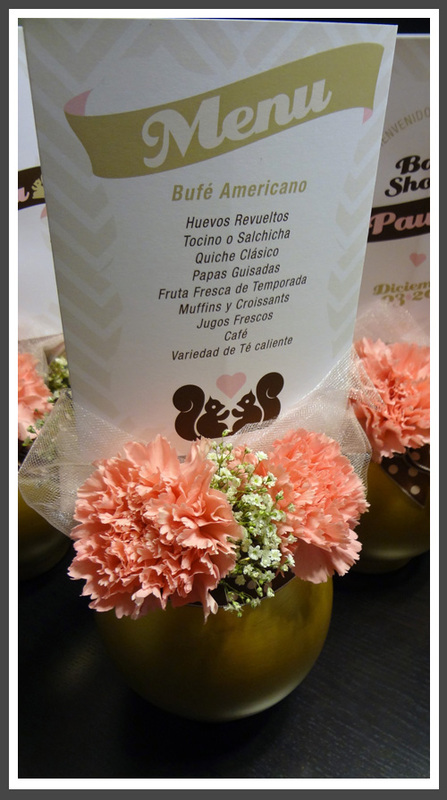 All of the signage, menus, and notes used the same graphic elements as the invitation. 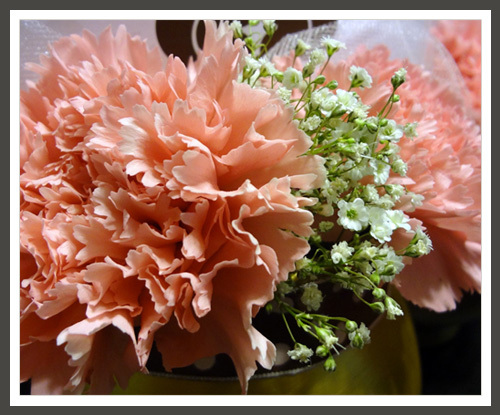 For the centerpieces above I painted the vases gold, used pink Carnations and Baby's Breath from the Farmer's Market, filled the empty space with pink tulle and tied a bow out of brown ribbon with pink polka-dots. 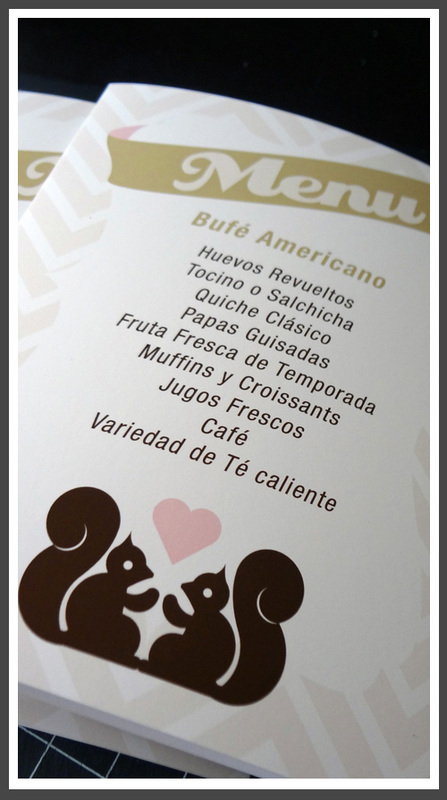 I inserted the squirrel motifs I illustrated everywhere to tie everything together. These above were a simple doily cut-out I created to place in front of the helium balloon base. It's all in the details, right?! 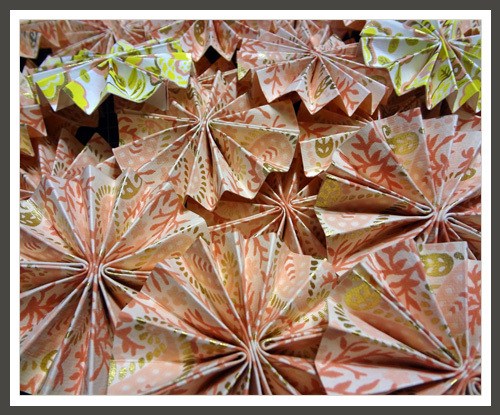 For wall hangings throughout the venue, I created these paper fan arrangements out of the leftover invitation paper. Paper fans were another recurring theme in the decor; from the wall hangings to the corsages. 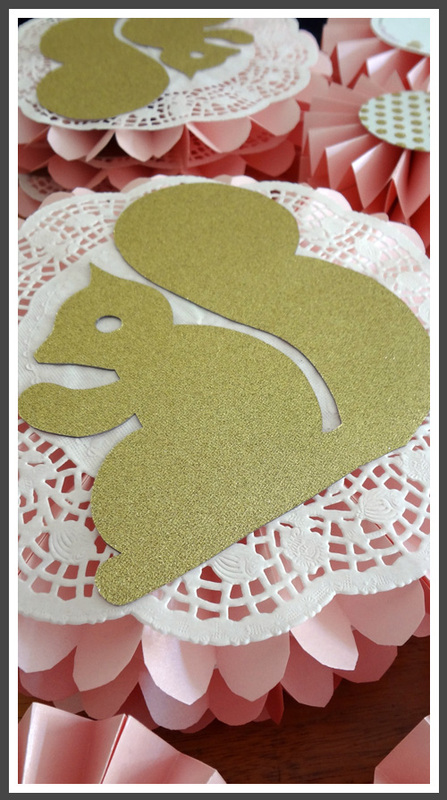 Of course, the squirrel was a must here too, so I traced the shape on glittery, metallic gold card-stock and cut it out to place over a doily. 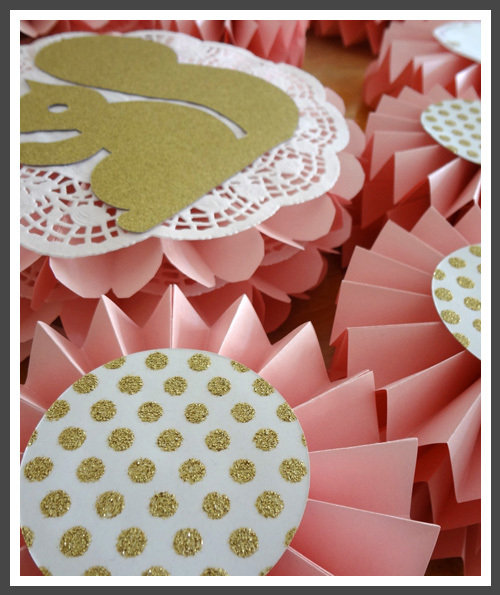 Smaller pink paper fans with a gold polka-dotted cut-out circle hung in a strand below the larger one with the squirrel. And yet again, more paper fans. 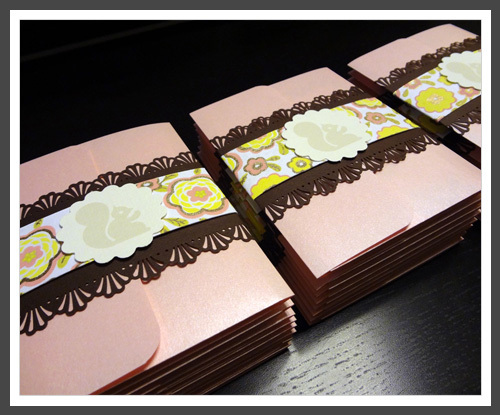 These were created out of another great find of hand made paper with pink and gold designs. 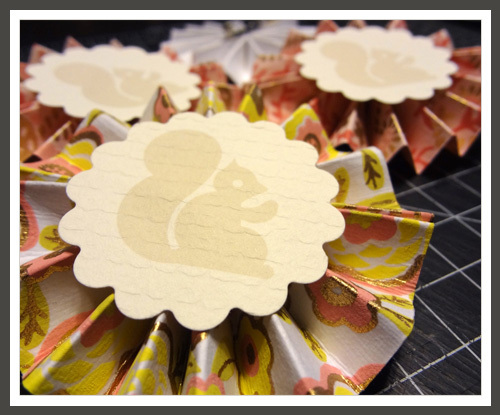 A squirrel printed on textured paper was a simple addition to the paper fan, and these were cut with a doily-shaped punch. I just added a corsage closure to the back and these were set. 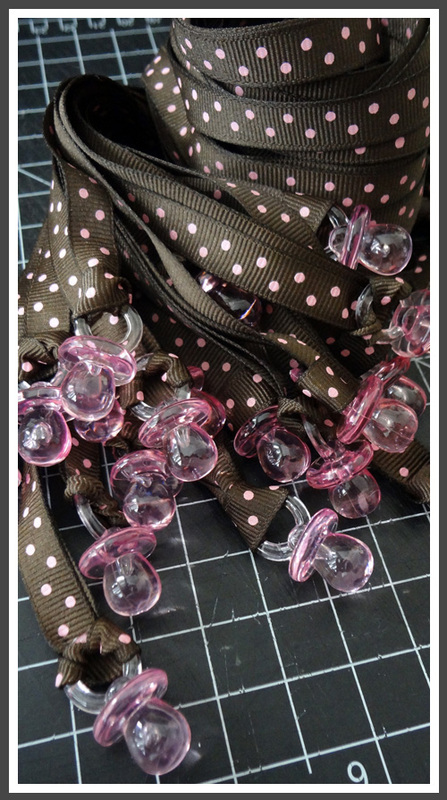 For a fun game, I created the pacifier charm necklaces with more brown and pink polka-dot ribbon. 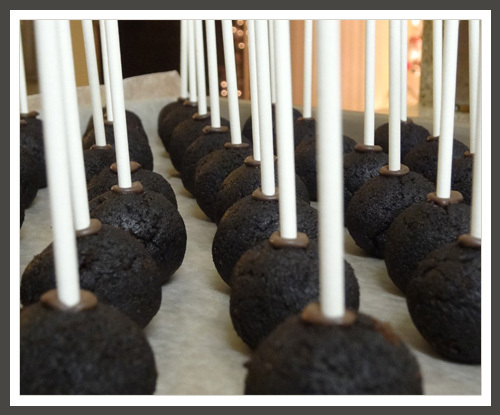 And, finally, as favors, I attempted for the first time to make cake pops. After much research on the wonderful Bakerella site and praying that they turned out ok, the pops were a hit...and they were delicious too!! 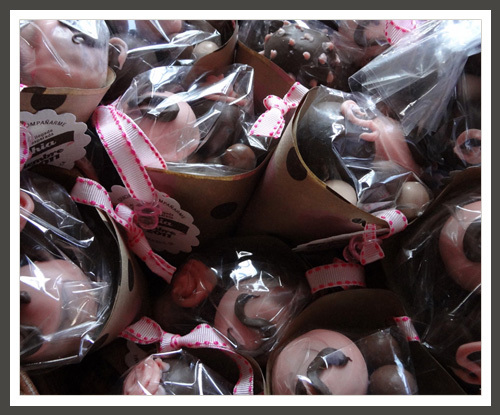 Of course they had to be chocolate with pink chocolate coating (as you'll see below). 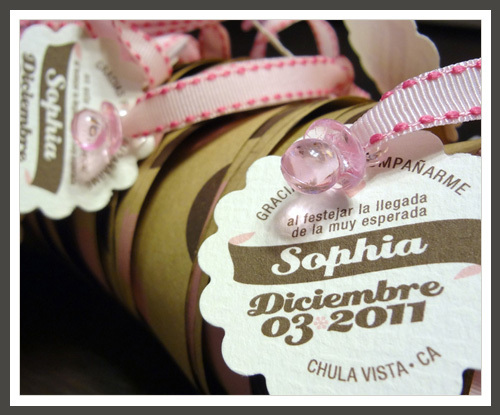 Another pacifier charm tied on a pink ribbon accompanied the favor tag and polka-dot paper cone (luckiest find ever: I found the craft paper with brown and pink polka dots at my local Dollar Store. It's as if it were calling me when I saw it from the corner of my eye as I asked the store attendant a question. A total last minute find!). This event proved to be a testament to my creativity under pressure...and under budget, too!! Many great surprises were found after some of the initial decor plans had to be scrapped. 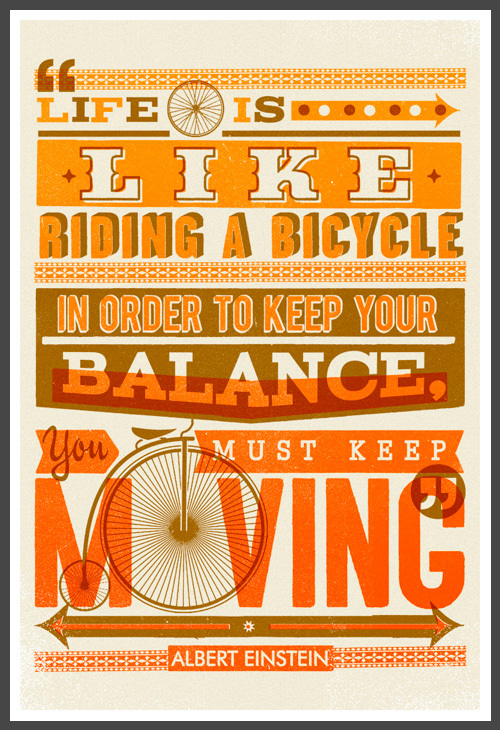 Always let yourself go with the flow when things don't seem to go how you envision. I can honestly say everything you see in the images above were plan b, and it turned out to be better than I had imagined. Many great things are coming to LizzyB Loves. 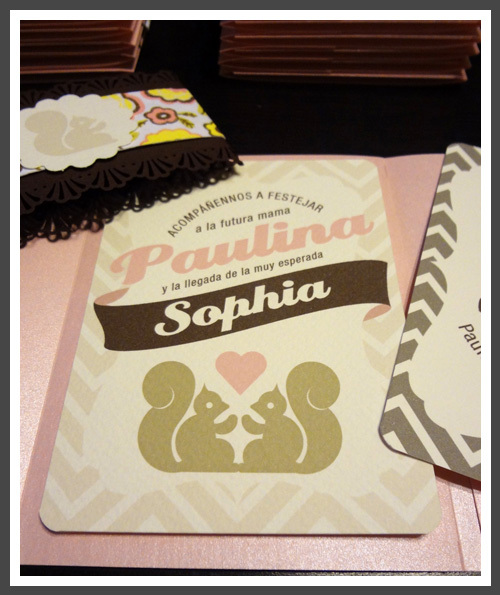 A new site for the coming Spring (with a new sneak peek in a few weeks) and much more, but in the meantime, take a look at the cutest Squirrel Baby Shower Invitations I designed for my sister-in-law's Baby Shower. She is now considered the Snow White of the family with all the little critters that flock to her (amongst them dogs, squirrels, and butterflies), so I based the custom illustration on her current pet, Squeeky the squirrel. 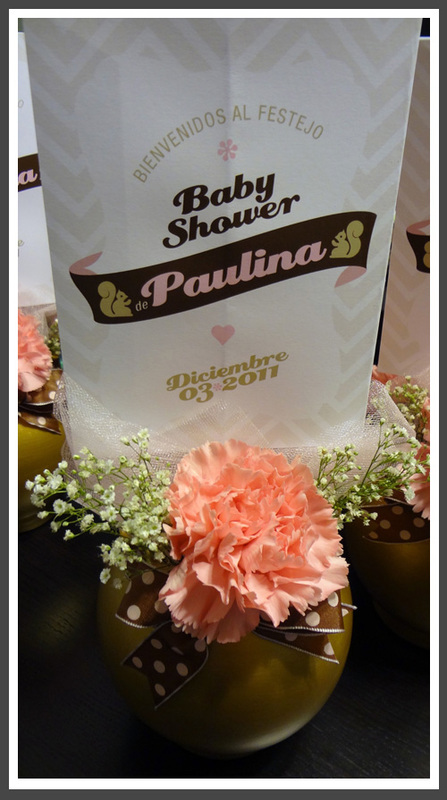 The color palette was a soft, rosy pink combined with a chocolate brown. I shared the visual + sparkle = inspiration with you here. All the illustrations were brought in together with graphic elements of chevron patterns and crest shapes. 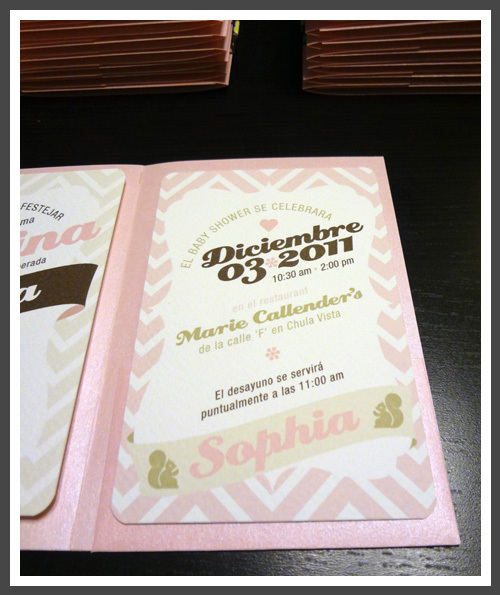 The invitation consisted of a metallic pink folder which held the invitation card on one side and double-sided registry card in the folder slot. 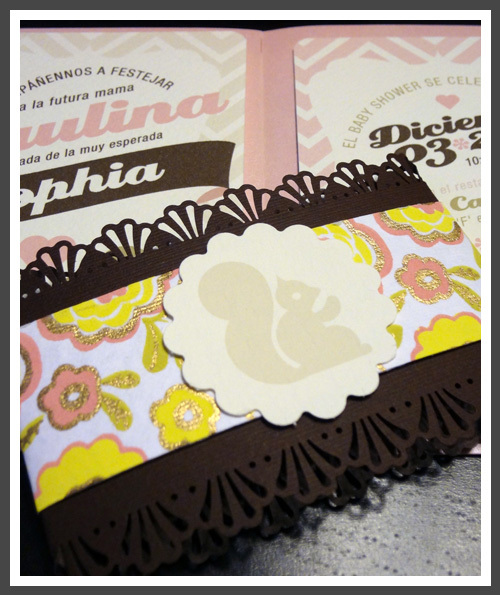 The Squirrel Baby Shower invitation was held together with a chocolate brown belly band to give contrast with the soft pink, combined with a floral patterned paper band to add a touch of brightness to the palette. 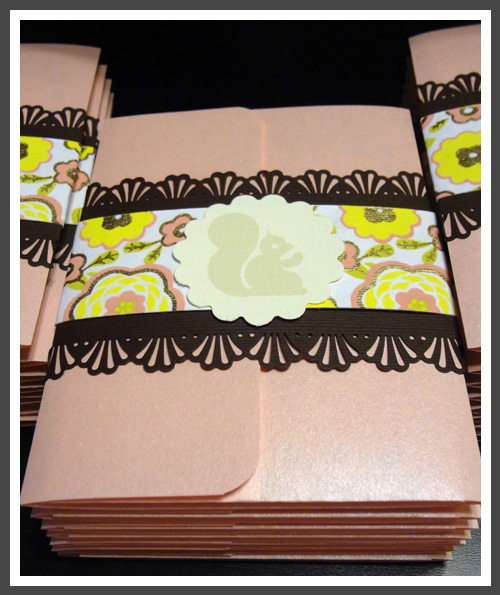 And of course the squirrel motif could not be left out on the front as the first thing the guest saw as they received the invitation. 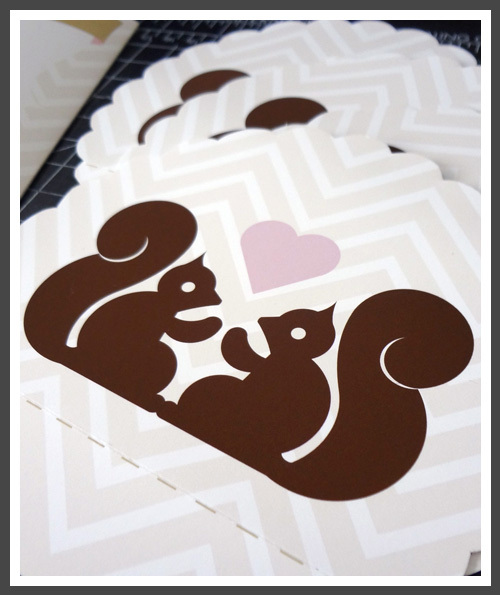 I'll share the decor pieces I created with the same chevron and squirrel theme in the coming days. Hello hello, I'm still here. I've been busy like a bee completing a few invitation suites in the Frank Lloyd Wright style which I'll share with you in a few weeks; you won't believe the fabulous color palettes these awesome brides came up with. 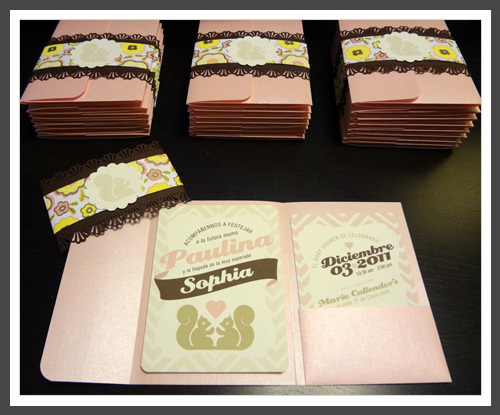 For now, I leave you with this pretty in pink, with a touch of brown and tan, visual + sparkle = inspiration which I put together in preparation for my sister-in-law's baby shower invitation. Soft and sweet, right?